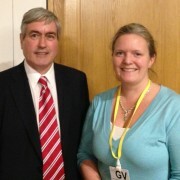 Iain Gray MSP attended a parliamentary reception for Scottish rural leaders this week and met local businesswoman Nicola Simpson from Fenton Barns Nursery. Ms Simpson is a participant in the Scottish Enterprise Rural Leadership Programme, which supports those playing an active part in Scotland’s rural economy to become a strong advocate for rural issues, and understand the rural planning and decision making processes. The programme was established in 2006 with the aim of enhancing business performance through developing rural knowledge and political awareness to improve the professionalism of rural Scotland at all levels. The current group is made up of a diverse mix of rural occupations including farmers, those involved in tourism and the food and drink sectors as well as vets, auctioneers, estate managers, the processing sector, supply trade and many other rural businesses. The Holyrood reception gave participants in the programme the opportunity to meet with their local MSPs and discuss issues of concern to them and the rural communities they are part of. “Businesses operating in the rural economy in East Lothian and elsewhere in Scotland often face very specific challenges. It is right that tailored support and advice is available to rural leaders to help them to rise to these challenges and make their business performance as effective as possible. 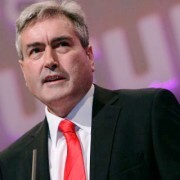 Iain Gray MSP and Fiona O’Donnell MP are supporting a new campaign urging UK Government Ministers to begin to put right the wrongs of the miners’ strike and the damage done to coalfield communities, including those in East Lothian. Earlier this month newly-released cabinet papers revealed that the Thatcher Government had a secret plan to close 75 pits at the cost of some 65,000 jobs; that the Government did seek to influence police tactics to escalate the dispute; and that they actively considered declaring a state of emergency and deploying the Army to defeat the miners and unions. • Release all information about Government-police communications around Orgreave, with a proper investigation which might go a little way to rebuild public confidence. Labour believes this must happen before the 30th Anniversary of Orgreave on June 18th this year. Ms O’Donnell and Mr Gray have written to the Cabinet Office Minister Francis Maude to demand an apology a response on these three points. Both politicians are also backing renewed calls for the SNP Scottish Government to conduct a review into the arrests and convictions made during the dispute, a proposal it has so far refused. “The 1984-85 miners’ strike caused significant and lasting damage to East Lothian’s coalfield communities. The men involved in the dispute, as well as their families, friends and neighbours who supported them, suffered terribly and it is now clear that this was due to an orchestrated campaign by Ministers in the Thatcher Government. “For those of us who lived through the strike and who saw the impact it had, what was revealed in the cabinet papers may not come as a surprise. But it is no less shocking to consider that far from being neutral, as was claimed at the time, the Government took a deliberately calculated political approach guided by a complete hostility to the coalfield communities. East Lothian Council’s latest bid to persuade the SNP Scottish Government to rethink its planned closure of Haddington’s Sheriff and JP courts has been welcomed by local MSP Iain Gray. 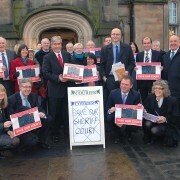 The Council’s chief executive Angela Leitch has written to the Cabinet Secretary for Justice to highlight concerns about recent figures for Edinburgh’s JP and Sheriff Courts, which show significant increases in the number of summary criminal cases being dealt with in the three months ending August 2013. Councillors have expressed concerns about the figures because they fear that the closure next year of Haddington’s courts will lead to further increases in the number of cases being dealt with. This could have a negative impact on the efficient administration of justice, the interests of victims and witnesses, who could face longer waiting times till a possible court appearance, and the effectiveness of any community-based punishment ordered by the court. In light of this information, the Council has asked Justice Secretary Kenny MacAskill to reconsider his decision to close Haddington Sheriff Court in January next year. Mr Gray has also written to the Justice Secretary to back the Council’s concerns and urge him to think again. “Those of us who led the campaign to save Haddington’s courts consistently expressed concerns about the capacity of Edinburgh’s courts to deal with the extra workload that the SNP’s court closures will create. These figures make it clear that Edinburgh’s courts are already bursting at the seams and adding cases from East Lothian and other smaller courts will put real pressure on their ability to administer justice efficiently. Happy New Year to all ELN readers. This is the year when Scots decide if they wish to live in a separate independent Scotland, or a Scotland which is part of the United Kingdom with its own devolved parliament. Late last year the SNP Scottish Government published its “White Paper” on independence. It had several hundred pages of “Questions and Answers”. Unfortunately these were the likes of “What will Scotland be called?” (Answer – “Scotland”), and none of the important questions about why Scotland would be better off were answered at all. The SNP want to keep the British Pound, the British Queen, British TV programmes, the British energy market, and a British banking system. They claim that we would simply carry on as members of the EU, and of NATO and that the rest of the United Kingdom would happily pay for Scottish renewable energy, build naval ships in Scottish yards and bail out Scottish banks if they failed. Independent experts have rubbished these claims, but even if they were true this is a strange kind of independence, with no control at all over our economy including things like mortgage rates. The truth is that the way to keep all these things, and the benefits the White Paper admits we need, is to remain part of the United Kingdom. The biggest promise in the White Paper is an increase in childcare availability. Yet that is already devolved and the Scottish government already control childcare provision! It really is a cheek to tell Scottish families that the government will not extend childcare unless they vote the way the SNP want in the referendum. Constituents have complained to me about the hundreds of thousands of pounds of taxpayers’ money being spent on producing and promoting this document. That has been raised many times in Parliament, but the SNP Government’s view is that they won an election in 2011 and so they are entitled to spend as much public money as they wish on their independence project. My view is that they would be better spending that money on things like childcare and education right now. 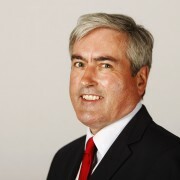 County MSP Iain Gray has expressed his disappointment at Police Scotland’s confirmation that East Lothian’s traffic wardens are to be withdrawn next month. Mr Gray had spoken out on the potential cost and impact on local parking of the police proposals and urged police chiefs to look again at the traffic warden provision. However, the decision to implement the proposals to remove the traffic warden service from Monday 3rd February was made shortly before Christmas. “The confirmation that our traffic wardens are to be withdrawn is very disappointing news for communities across the county. At the end of last year, I spoke out about local people’s concerns regarding the potential impact of this proposal and urged Police Scotland to rethink its plans. So the decision to go ahead with the withdrawal of traffic wardens here is a real blow for our town centres. Iain Gray MSP is backing Shelter’s Wake Up Scotland campaign to raise awareness of the plight of homeless households in Scotland this Christmas and the poor quality of temporary accommodation they are often forced to live in. The charity says that nearly 5,000 children in Scotland will wake up in temporary accommodation on Christmas Day this year. It is calling on the Scottish Government to adopt guidelines on minimum standards of temporary accommodation and give families the legal right to challenge the appalling conditions they are often forced to live in. In December last year, Shelter helped more than 1000 people at risk of becoming homeless over the festive period. In June this year, there were 10,471 households in temporary accommodation across Scotland with 155,100 families and individuals on council waiting lists. The main causes of homelessness include relationship breakdowns and job and income losses leading to eviction or home repossession. “The fact that so many children in Scotland will spend this Christmas living in temporary accommodation is an absolute tragedy. I am pleased to back Shelter’s call for the Scottish Government to commit to a set of guidelines for standards in temporary accommodation and to change the law so families can challenge the appalling conditions they are often forced to live in. The county’s MSP and MP have visited the Fraser Centre in Tranent to hear more about the social enterprise’s ambitious plans for the future. Iain Gray and Fiona O’Donnell met with the Fraser Centre Community Trust chair Jonny Russell and Development Manager David Orr for a tour of the facility and a discussion about the centre’s current activities and objectives for future development. They were impressed by the plans for establishing the centre as a learning, development, arts and entertainment hub at the heart of the local community in Tranent and offered their support for taking the project forward. 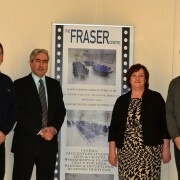 “The Fraser Centre is one of several innovative and forward-thinking social enterprises now operating in East Lothian. I was glad of the opportunity to see the progress that has been made over the last couple of years and hear more about its ambitious plans for the future. “I was really impressed by what the Fraser Centre Community Trust has achieved in a relatively short space of time. It already offers local people the opportunity to watch movies and participate in other arts and cultural activities. County MSP Iain Gray has welcomed the conclusions of the final study into the proposal to provide a local rail service from Edinburgh to Dunbar and Berwick, including the development of a new station at East Linton. The study, which was commissioned by SEStran, East Lothian Council and Scottish Borders Council, underlines the strong business case for the introduction of Edinburgh to Berwick local services. It also supports the plan to open new stations at East Linton and one in the Borders at Reston. 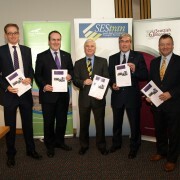 “This study provides a clear and comprehensive business case for the proposed Edinburgh-Dunbar-Berwick rail service. It also underpins the strong economic and social case for a new station at East Linton and the benefits it would bring for the local community there. I welcome its findings and the important boost it gives to the argument in favour of these new rail services. “Although the report indicates that such a service would need a subsidy, that is true of almost all rail services in Scotland, and the level identified is very affordable in a franchise which sees government invest hundreds of millions. This is not too much to ask for East Lothian. In any case many of us believe that once the service was up and running, and East Linton station open, passenger numbers would outstrip the predictions in the report and reduce the need for subsidy. All our stations in East Lothian have seen significant passenger growth. 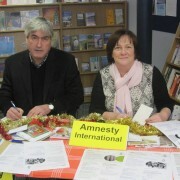 Iain Gray MSP and Fiona O’Donnell MP joined members of the county’s Amnesty International group at the John Gray Centre in Haddington recently to write Christmas cards supporting prisoners of conscience and others suffering human rights abuses around the globe. The Amnesty group encourages people to send the messages of support and solidarity as part of the annual Write for Rights campaign in order to inspire, motivate and encourage others. The cards also send a warning signal to the authorities that their actions are being observed and scrutinised by others and can even help to secure freedom for some of the individuals facing persecution. Write for Rights successfully connects men and women, young and old with people elsewhere who have been wrongly imprisoned, at risk of harassment and intimidation or whose rights have been violated in other ways. It is also an effective way to encourage family members to maintain their pursuit for justice on behalf of their loved ones, and it offers a chance to urge the authorities to uphold and respect basic human rights. Iain Gray MSP is supporting a campaign to promote the unique and vital role of health visitors in the health and well-being of families and local communities in East Lothian and across Scotland. 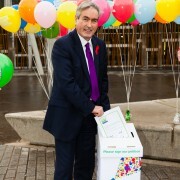 Mr Gray joined health professionals and campaigners from around Scotland at the Scottish Parliament this week to mark the handover of the Health visitors for Scotland petition to the Minister for Children and Young People, Aileen Campbell. Campaigners are calling on the Scottish Government to seize the opportunity to improve the health and wellbeing of Scotland’s children by ensuring all families have access to health visitors. The petition highlights the unique and essential contribution health visitors make to the health and wellbeing of families and local communities across Scotland. It also calls on the Scottish Government to enshrine a statutory entitlement to universal health visiting services and to ensure that the Named Person for the 0 – 5 age group is the health visitor in the Children and Young People Bill. The Named Person is a concept that is already being rolled out in many areas of Scotland, and acts as a first point of contact between a child, their family and key services. The post, which was developed in response to feedback from parents, is filled by midwives for the first 10 days of a child’s life, then the health visitor, before responsibility is handed over to schools at the age of 5. The Children and Young People Bill – which passed Stage 1 last week – aims to enshrine the Named Person in law. “I know from speaking to parents in East Lothian just how much they value the unique expertise of health visitors and the important role they play supporting families with very young children. However, workloads for health visitors have increased dramatically in recent years, putting them under increased pressure and undermining the service in some areas. “Timely action by health visitors can reduce problems in later childhood, promote self-care and resilience, and prevent ill health throughout life. It is, therefore, a crucial preventative service in the early years. The Health Visitors for Scotland campaign is being run by the Royal College of Nursing Scotland in partnership with a variety of other professional bodies and charities, including Children in Scotland, The Queen’s Nursing Institute Scotland, The Royal College of GPs and Parents Across Scotland.